If you’re looking for a place with stunning architecture, a sunny Southern climate and flower-filled patios to die for, then Cordoba might just be the one for you. In May these sleepy Spanish streets come alive to the Festival of the Patios, and the secret beauty of the courtyards is revealed. May is a great month to see Cordoba as the Festival of the Crosses takes place at the start of the month, before temperatures nudge too high. 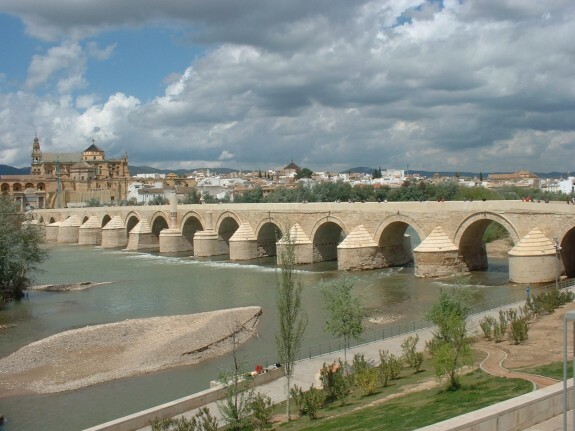 In July and August Cordoba is one of the hottest places in Spain. The battle between Moors and Christians is at the very heart of this city and the awe-inspiring Mesquita-catedral is rich evidence of this. One of Spain’s iconic buildings, the Mesquita is part mosque, part cathedral and full of atmosphere. 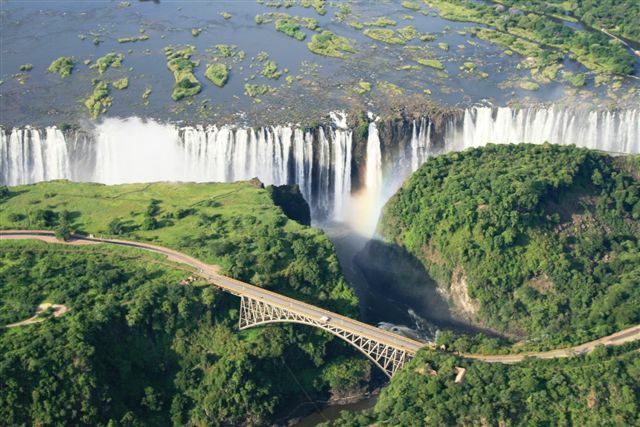 Arrive early and you can enjoy the peace and beauty for free before the tourist and student parties arrive at 10am. 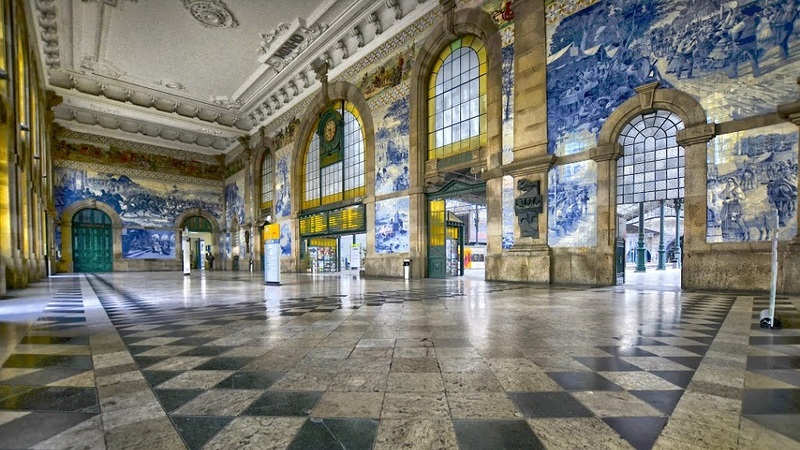 Over a thousand pillars create this huge and airy space. It’s hard to imagine that this peaceful city was once the capital of al–Andalus and much of the Iberian peninsula was ruled from here. 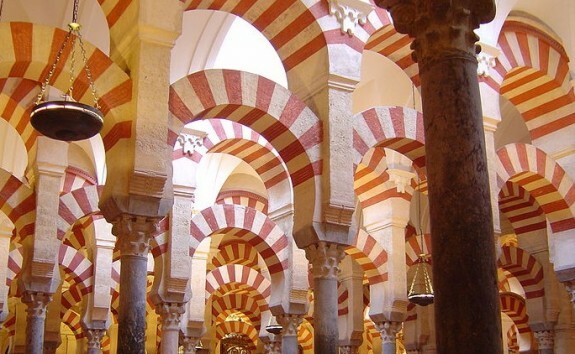 At the end of the 10th century, Cordoba was a seat of learning, culture and commerce, with 3ooo mosques and 300 public baths. Sadly fortunes declined and neighbouring Sevilla became the capital of what is now Andalucia. 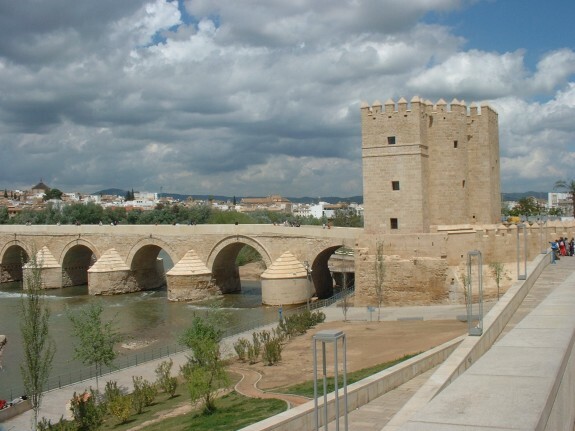 In 1236 Cordoba was laid seige to and conquered by King Ferdinand 111 of Castile, during the Spanish Reconquista. The Inquisition headquarters were based in the striking Alcazar de los Reyes Cristianos. It’s not a great idea to try to drive into the historic centre. A maze of winding streets, it’s far better explored on foot. You can park above the embankment on Avenida Confederacion, from where you have a wonderful view of the city and the Roman Bridge which spans River Guadalquivir. Stroll past the Calahorra Tower, part of the city defences, and across this magnificent bridge with its 16 arches to reach the Europe’s largest historic centre, protected by UNESCO status. A good place to start your explorations is the Alcazar de los Reyes Cristianos (fortress of the Christian monarchs). The original alcazar was beside the Mesquita on the site of the present Bishop’s Palace, and was built in the 8th century as a residence for the caliph. 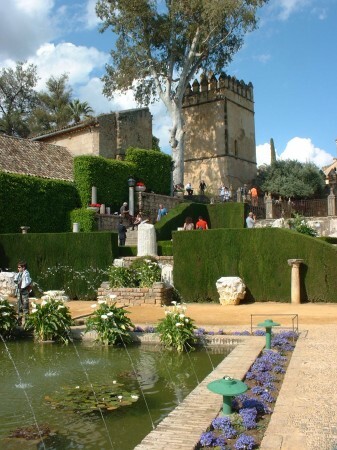 Todays fortress and the Moorish gardens which are its main attraction were constructed in 1328. Ferdinand and his queen Isabella lived here while they prepared to reconquer Granada, the last Moorish stronghold, and Christopher Columbus came to the Alcazar to make his case to Isabella for his journeys of discovery to America. It is the Paseo de los Reyes that draws most admirers. Fountains play across the ponds and statues line the gardens. It is a serene and lovely space. From July through to September the gardens are illuminated, 10pm to 1am. Time now to wander the narrow white-washed streets behind the Mesquita. 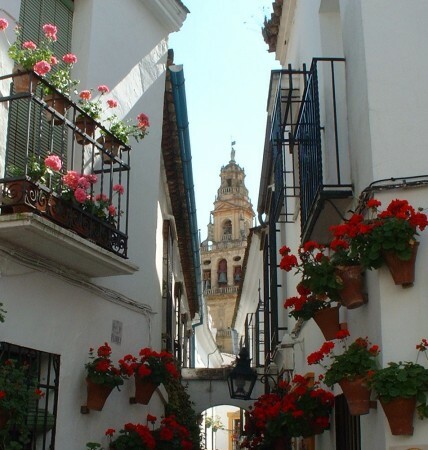 Calleja de las Flores is just one of many pretty lanes, lined with shops and restaurants. Delving back you will find yourself in the Jewish Quarter, famed for its jewellers and silversmiths. In Calle de los Judios you will find the small atmospheric Synagogue which is one of only 3 remaining originals in Spain since the expulsion of the Jews. Nearby Casa Sefarad has been restored to how it would have been in the 14th century, telling the story of these influential people and their place in Cordoba’s history from Roman times. A scupture to philosopher Maimonides stands in Tiberiadus Square. Traditionally his foot is stroked for “good luck”. Puerto de Almodovar is the western boundary of the Juderia and one of 3 gates to the city to survive from 13. Beyond these you have a fine view of the existing city walls with their beautifully landscaped fountains and gardens. If you have time you could experience an arabic bath in the authentically styled Hammam Al Andalus, Corregidor Luis de la Cerda 51. Tel +34 902 333 334 for appointment. One experience you certainly won’t want to miss is a night of flamenco at the Tablao Cardenal, next to the Mesquita. 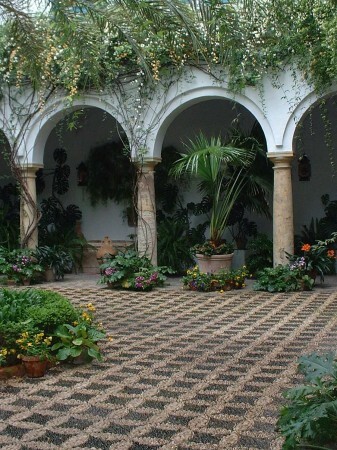 If you’re visiting outside of May you can still get a feel for the patio culture of Cordoba. 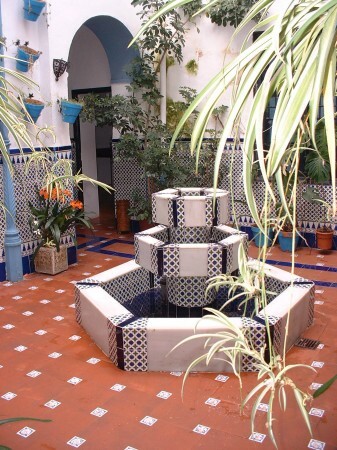 Almost every doorway you look through discloses a cool space , lined with tiles, flowerpots and fountains. 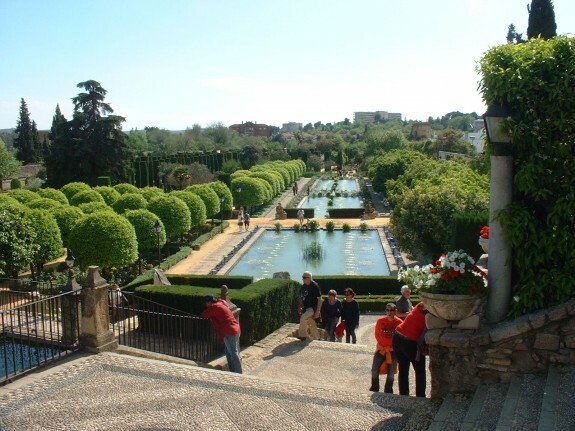 Or you can venture into the city to Palacio de Viana, Plaza de Don Gome 2, with its 12 patio gardens. Faded grandeur at its very best. For nights full of passion, the traditional guitar festival takes place in July. Food in Cordoba is wonderful. Tapas and raciones (a larger portion than tapas) are widely available. I particularly liked salmorejo (gazpacho with hard boiled egg and serrano ham on top). For an evening meal in beautiful surroundings I could highly recommend El Rincon de Carmen, Calle Romero 4. My crispy fried aubergines with honey, followed by flamenquins (rolled chicken and serrano) were delicious. Eurostar Maimonedes, Torrijos 4, is an excellent central hotel facing the Mesquita. There are many reasonable options, often with delightful internal patios of their own.